The inspiration for this dish came from Simply Recipes. I had already used up all of my leftover turkey, but I did have some leftover cooked chicken. I made more than a few nondairy adjustments, but the end result was perfect comfort food for a cold December evening. Thumbs up from my food testers, too. Enjoy! Cook the pasta according to package directions, til al dente. Drain and set aside. Prehead oven to 375℉. Cook the mushrooms in 1 tablespoon margarine over moderate heat, stirring until all of the liquid they give off has evaporated, about 10 minutes. Set aside. In a large heavy saucepan, melt 5 tablespoons margarine, then stir in the flour and cook mixture over low heat, stirring constantly for about 3 minutes. Gradually stir in the nondairy creamer, broth, and the wine or sherry. Bring to a simmer and cook over medium heat, stirring constantly, for about 5 minutes. 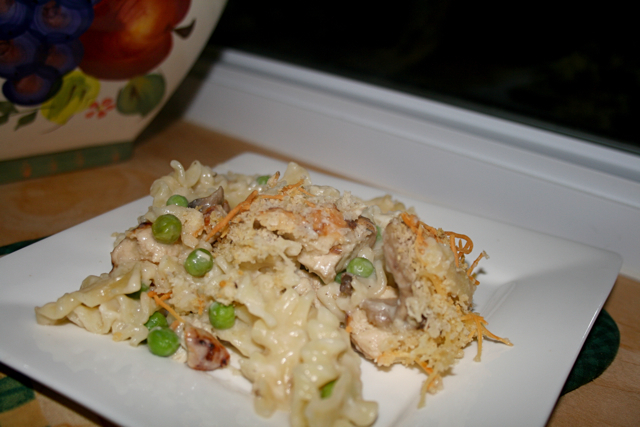 In a large bowl, combine well the pasta, the sauce, the mushrooms, the chicken, the peas, and salt and pepper to taste. Stir in 1/3 cup of the parmesan and the Swiss cheese. Then transfer the mixture to a greased shallow 3 quart casserole. In a small bowl, combine well the remaining 1/3 cup parmesan, the bread crumbs, and salt and pepper to taste. 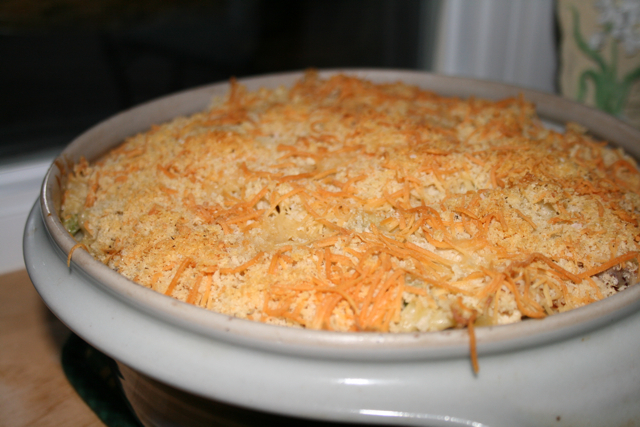 Sprinkle the mixture evenly over the Tetrazzini, and dot the top with slivered margarine bits. Bake in the middle rack of the oven for 30 – 40 minutes, or until it is bubbling and the top is golden. Makes 6 servings.